The UK authorities are conducting an investigation into a world-renowned Bahraini human rights activist Nabeel Rajab and his family and have seized their passports immediately after he entered UK after spending 2 years in a Bahraini prison, Rajab told RT. Rajab, who is president of the Bahrain Center for Human Rights (BCHR), also highlighted the hypocrisy of UK's foreign policy in the Gulf region, stressing that it is driven by arms sales, and oil profits. RT:How is the protest movement faring in Bahrain? 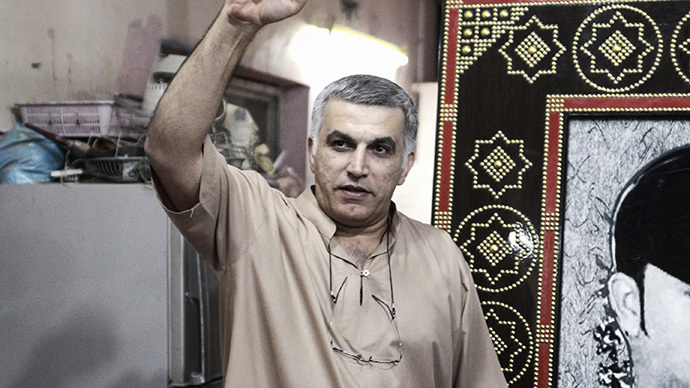 Nabeel Rajab: Well, the protest movement is so huge and so big like before or more. Unfortunately you hardly can hear about it in the international media because the Gulf regimes could silence the international media, could silence the international community, frightening them. 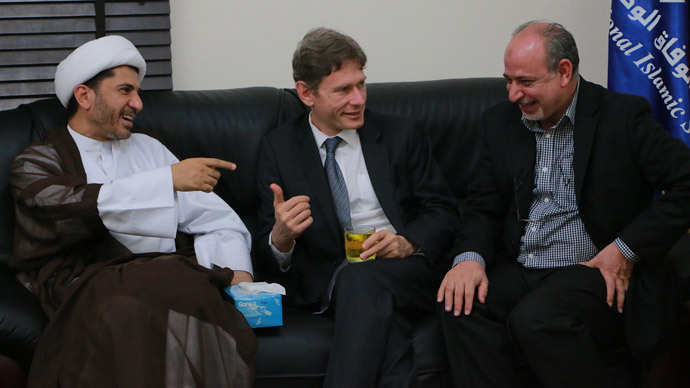 In civilized countries, like European countries, like the US, hardly you can see criticism of Bahrain, even in the media. As you know, the media is either owned by the ruling families in our region or influenced by the ruling family. So unfortunately with the oppression that we have in town, in Bahrain, with the revolution that we have, maybe it is the hugest in terms of percentage, the hugest revolution you have ever seen in history, but you would hardly see it on the TV. And that is because of the impact of the ruling family, of the money, of the wealth from the arms sales, of the oil, to silence or to buy the silence of the international community. But on the ground – more repression, more people in detention. Thousands of people are behind bars, thousands of people flee their country. Lots of people are hiding. Dozens of people were killed, hundreds of people were wounded. Hundreds of thousands of houses being raided on a yearly basis. A lot of houses are being robbed by the security personnel. 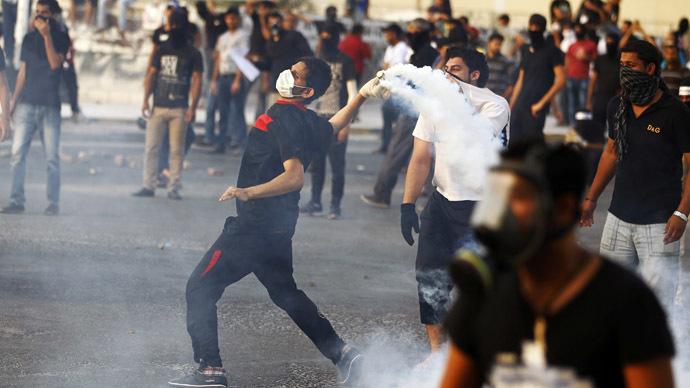 So the repression is the worst according to human rights organizations, including the UN. But unfortunately as I've said, again and again and again, that we are in a rich region and we are paying the price for being in a rich region. A rich region which could silence the civilized world countries like US, UK and other European countries. RT:You mentioned a moment ago that Bahrain has a reason to clamp down on democratic values – you said oil, you said military contracts, could you just clear that up for us? Why is it clamping down and why is the world media being so quiet? NR: The media we have in the region, the Arab media it is owned by those Royal families of the Gulf. Or you have the international media like the BBC, CNN, like the others, where the Gulf countries have the influence on them through their countries. 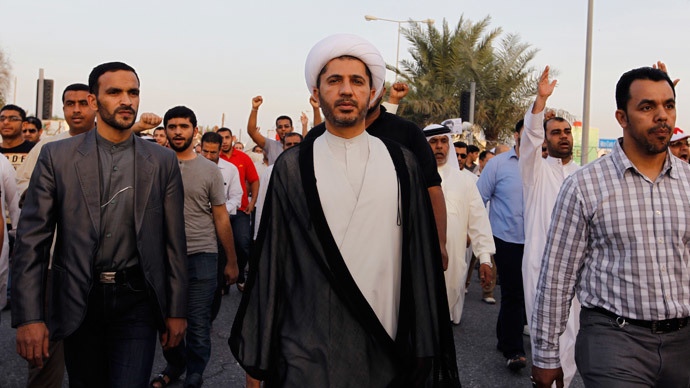 The oppression we have faced in Bahrain is worse than anything. But nobody wants to speak about it because nobody wants to anger the Bahrain government. Because angering the Bahrain government is like angering Saudi government and everybody needs oil from those countries. And everybody needs to make arms treaties and arms sales for those governments. To do so, you should be silent. Those countries with their money, with their wealth, with their oil have bought the silence of the international community. And that is why you don't hear anything about it. Until now, as I'm talking to you, my passport is being held by the UK authorities, not for doing a crime, just for doing a human rights job. RT:You are in London, you've said that you have been harassed at Heathrow airport, they have seized your passport... What on earth were they harassing you about? NR: Not only my passport, also my 2 children and wife's passports. It is till this moment, as I'm talking to you, it is still with the authorities. They say they want to do an investigation, because I was in jail in Bahrain. Because I was jailed for taking part in a peaceful protest calling for democracy in Bahrain. At the same time we see the UK government receiving human right violators from my country. People who committed a crime are received on the red carpet in here, and human right groups and human rights people are being harassed, being discredited by the UK government. I'm just giving this to you as an example of how the civilized world has treated our revolution, how the civilized world, democratic governments have treated our people and our revolution in the last few years. This hypocrisy needs to be highlighted. We should shed light on the hypocrisy of what is being called the civilized government and a civilized country, and how they treated our revolution. Unfortunately, until this moment as I'm talking to you they are sending arms, they are sending weapons, they are sending the equipment that is being used to violate the rights of those countries. And I think the people of those nations need to wake up and to see how much their government is working on making these violations happen in our part of the world. Unfortunately what has happened to me is just one thing out of many that has been happening.